A big building site has dominated Otaniemi for almost three years, but in September 2018, the campus has hatched from the scaffolding. Most of the brand-new building complex has now been taken to use, and the rest of the facilities will be completed at the turn of the year. The new block consists of three integrally interconnected buildings: Väre, the School of Business and the shopping centre A Bloc, in connection with Aalto University’s metro station entrance. Each building has its own entrance and address. The red brick building complex comprising four floors is a perfect match for Otaniemi’s visual identity and architecture. It consists of rectangular modules, whose lines are designed to follow the coordinates of the closely situated buildings designed by Alvar Aalto: Aalto University Undergraduate Centre and Harald Herlin Learning Centre. An international architectural competition was organised in 2012–2013 regarding the design of the heart of the campus, and the winning entry was submitted by Verstas Architects. The design was described as fresh, clear and distinct. One of the strengths of the proposal was its flexibility of spaces, should the need for new space solutions arise. User orientation and sustainable development were already emphasised in the competition programme. Solar panels and geothermal energy now produce energy for almost the entire building. Shopping centre A Bloc located next to the metro station entrance was the first new building to open its doors. It offers a wide range of services such as coffee shops, restaurants, shops, and sports facilities. Aalto University’s own shop opened in August 2018. It sells university publications as well as products designed by students. There are numerous permanent artworks in the new buildings, following the percentage for art principle Aalto University is committed to. All artists are connected with the university through study or work. Galleries and exhibition spaces displaying changing exhibitions also showcase art created by students. Väre, the new building of the School of Arts, Design and Architecture, was officially opened in September 2018. It houses workshops, studios, rooms for small group work, teaching and office facilities, facilities for independent work, as well as places for hanging out and meeting people. The main entrance of Väre opens into a spacious lobby. A wide wooden staircase leads to the hustle and bustle of workshops, which can be observed through glass walls. The majority of the activities of the School of Arts, Design and Architecture were located in the former Arabia factory in Helsinki. ‘The building project and the transition to Otaniemi were prepared carefully by the whole community, and we wanted to ensure that the views of end-users were considered’, says Project Manager Sari Dhima. The spaces are flexible and configurable. Everything, apart from staircases, outer wall and toilet facilities, can be modified to suit the needs of the end-users better. Teaching in the field of art and design requires a large amount of physical space, and it is still available in the new building, but in a more efficient manner. ‘The spaces are flexible and configurable: furniture can be moved and lighting adjusted. The modularity of the spaces makes it possible to add and remove partition walls as required. The departments do not have their own studios, but facilities meant for building prototypes or making patterns, for example, are in shared use’, Sari Dhima continues. Although design today is largely computer-based, workshops are needed for testing the functionality of engineered solutions, experimenting with materials, and making prototypes and models. ‘The designer must understand concrete matters in order to visualise a functional solution. High-quality workshop and studio facilities provide a connection between manual skills and thinking, thus combining theory and practice. They are the strength of Aalto University on an international scale, and we want to maintain them’, says Dhima. Master’s degree students, doctoral candidates and staff of the School of Business will move to the new building from the traditional Töölö campus in February 2019. Bachelor level students have been studying in Otaniemi already for a couple of years. There are four floor altogether. The ground floor has a restaurant, a wine bar, a café and teaching facilities. 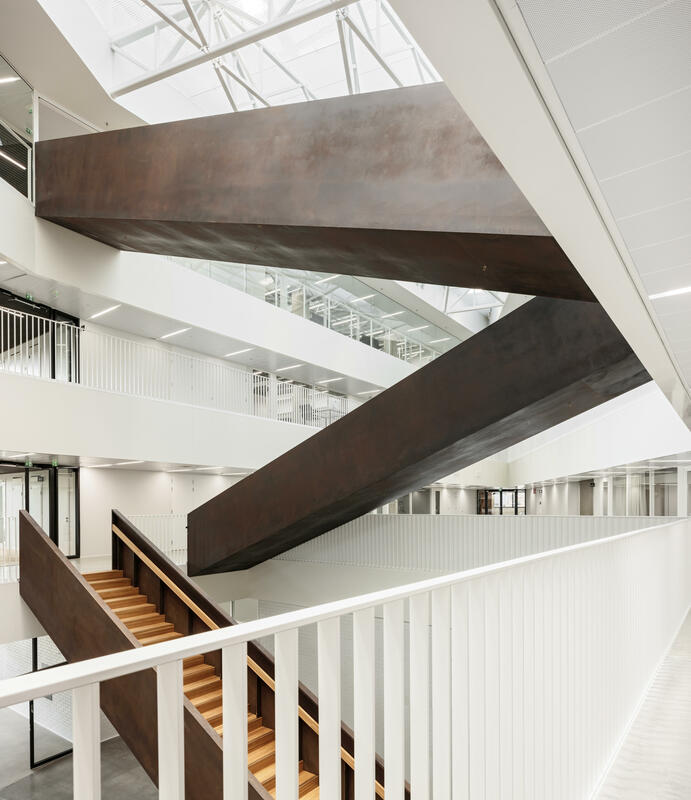 The upper floors contain spaces such as the BIZ Learning Hub for students, meeting rooms and facilities for departments and services. 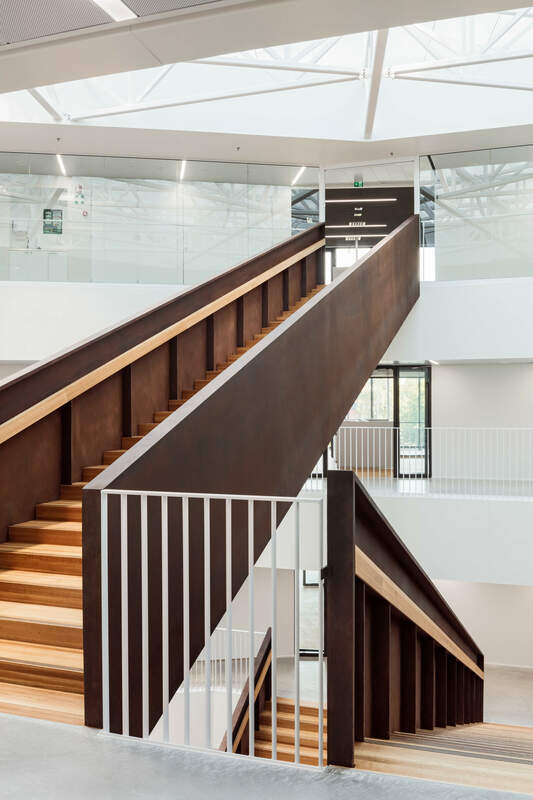 The interior design solutions are aligned with the spirit of the School of Business and inspired by the school’s history and the architecture of the building: a lot of wood and repeat patterns can be seen. Users of the School of Business have been heard in the planning of the new premises, and, in addition to students and staff, also alumni have taken part. ‘The new facilities and technology offer great opportunities for the development of teaching. We piloted technology solutions already in Töölö, and solutions proven to be good will be implemented in the new building’, says Perttu Kähäri who manages the School of Business relocation project. ‘It’s great that we can now move to the joint campus and become an even more integral part of the Aalto community. The activities of the School of Business are essentially based on people and interaction, and we have wanted this to show in the new premises’, Kähäri says. Väre and the School of Business building contain teaching and study facilities and services that are available to both schools. 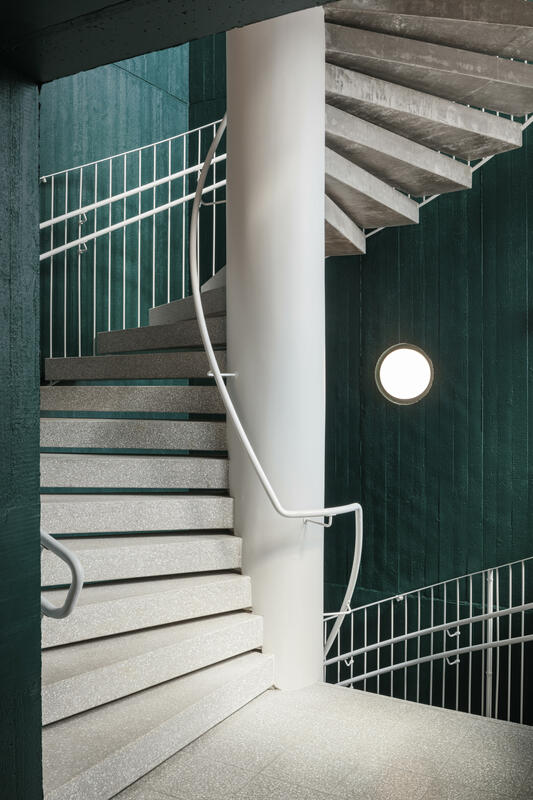 Amongst the first people moving to the new facilities were Aalto University’s multidisciplinary Master’s Degree Programmes in International Design Business Management and Creative Sustainability. Otaniemi gained many new services when shopping centre A Bloc opened its doors at the end of August 2018. A Bloc can be found at the bustling heart of the campus, in the same block with Väre and the School of Business, by the entrance to the Aalto University metro station. The shopping centre is home to concepts developed especially for the Otaniemi area, such as the Who the xxxx is Alice, pizzeria and bar offering drinks and Neapolitan pizza, as well as the Lab Store, a new store concept by Clas Ohlson. A Bloc also has restaurants, cafés, shops and other services for the daily needs of those living, working or studying in the area. The shops and restaurants are open from morning till evening on both weekdays and weekends. ‘I believe that A Bloc will become a place with a genuine Aalto style – a place where the members of the community want to spend their time and meet up with each other’, says Eetu Ristaniemi, Director of Real Estate Investments at Aalto University Properties Ltd.